In 1857, Archbishop Dr James Goold invited Mother Ursula Frayne, a Mercy sister, to establish a convent and school in Melbourne. So began the Mercy story in Victoria. Discover how our story has unfolded alongside Melbourne’s story, and how our philosophy has taught generations of young women to deeply appreciate our vision and values. The Academy is dedicated in a special way to Mary, the Mother of God, under her title ‘the Immaculate Conception’. Another scriptural title of the Blessed Virgin Mary, Speculum Sine Macula, or ‘mirror without blemish’, is incorporated in the Academy badge, which was designed in the school colours of blue and white. 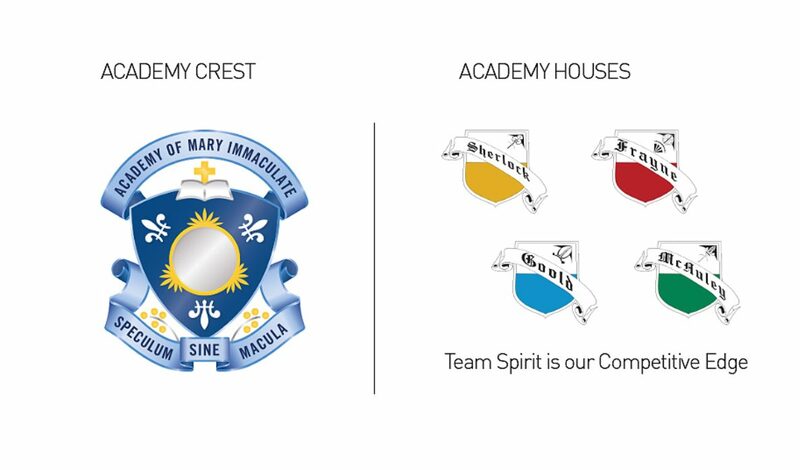 Below are the main symbols used in the Academy of Mary Immaculate’s crest to demonstrate the ideals and beliefs we value. Mirror: The rays of light and lilies represent Mary, the true woman. Cross: Sitting above the shield, it represents faith. Wattle: Symbolises a love of home and country. Find out more about the renaming of the College buildings and our early history being reflected in the names of the four school houses – McAuley, Goold, Frayne, and Sherlock.